This entry was posted in books and tagged books history on February 22, 2016 by James Day. If you weren’t able to visit the BMW Museum to see “The MINI Story” exhibit before it closed last month, you can still read the companion book. 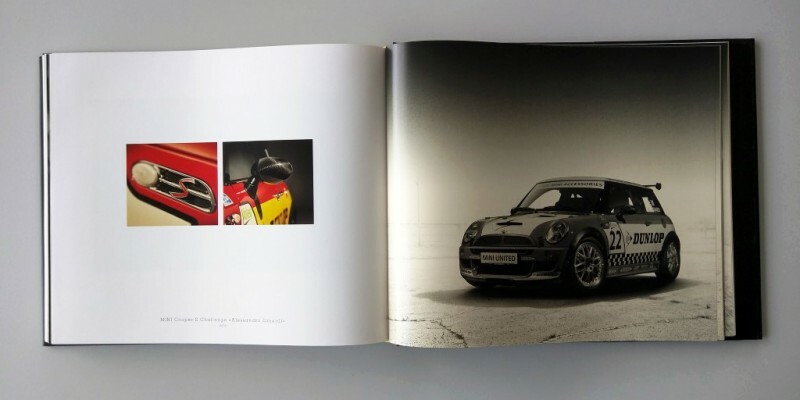 The MINI Story was edited by Andreas Braun, Curator of the BMW Museum, and published in cooperation with BMW and MINI. The book’s text is bilingual, each page’s left column written in German while the right column is in English. It’s a big and heavy book—it certainly can be classified as a coffeetable book—measuring in at 12.9″ wide by 10.9″ tall by 1.0″ thick. 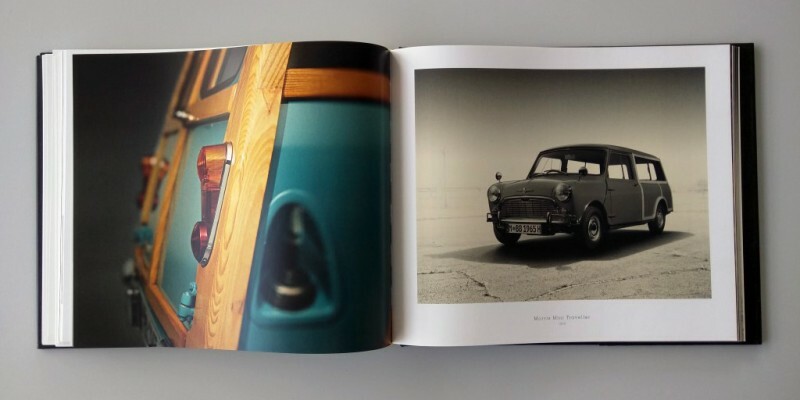 It contains 236 pages, many filled with full-page photographs taken by automobile photographer Erik Chmil. The “Words of Welcome” is by Peter Schwarzenbauer, Member of the Board of Management of BMW AG, and the Forward is by Gabriele Fink, Director of the BMW Museum in Munich. The MINI is a Legend. Its success story began in 1956 when the British Motor Corporation commissioned engineer Alec Issigonis to develop a revolutionary small car offering the maximum interior space on a minimum footprint. Three years later the task was realized brilliantly, and in 1959 the first Mini rolled off the production line. At just 3.05 metres long and 1.41 metres wide the car seated four passengers and had a boot capacity of 195 litres. It was the birth of the first small car that was not just tiny but that also fulfilled all the functions of a ‘grown-up’ automobile. But the Mini was more than just a miracle of space. It was a car unlike all others that defied convention and created a lot of driving fun into the bargain. It embodied the spirit of the Swinging Sixties, becoming a cult object almost overnight. As a star of the rallying world the Mini claimed many legendary victories. A new chapter in the history of this small car was opened in 1994 when BMW AG acquired the brand. With the launch of the first new MINI in 2001 the foundation stone of future MINI generations was laid. Alongside all the adjustments for modern technology and comfort, the essential characteristics of the original Mini were preserved. A timeless classic in the history of the car, after more than 50 years the MINI still represents an innovative concept of space, youthful design, unconventionality and its own MINI lifestyle. Despite the book’s large size—and due to the book’s duel languages—it doesn’t go into too much depth in any of its topics. Again, consider that this is a picture book written as much to entertain as to inform. It’s also, of course, a bit of a marketing tool, often reading like a press release. There is fascinating information inside and the full-page drawings and photographs are excellent. The book would be worth buying for the images alone, you’ll be tempted to cut them out to hang on the wall. Identity and Lifestyle is perhaps a strange subject to begin an automotive book, but this is Mini. “MINI in Advertising” is the very first topic with the first image being one of the newest ads, the “Spot the Difference” ad for the new MINI 5 Door. But that’s it for the MINI, the next few pages taken up by images of classic Mini ads. The chapter continues with “MINI at the Movies”, “MINI in Art”, “The Swinging Sixties”, and “Fashion”. 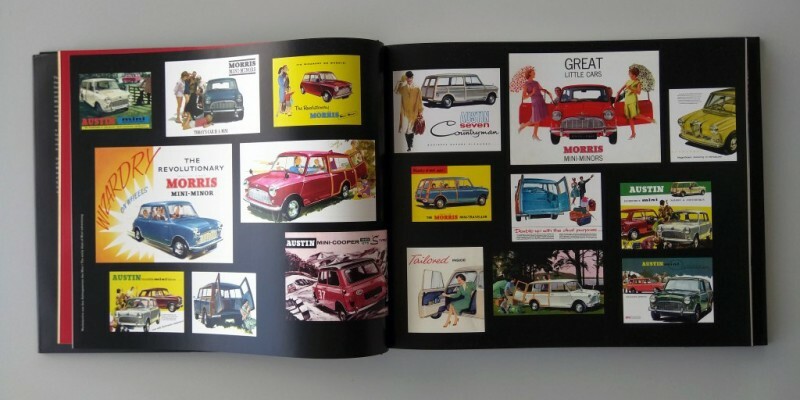 After covering MINI’s cultural impact, the book moves onto more traditional ground with a brief historical overview of the brand. After a two-page timeline, the chapter starts with a look at “The Logo” and “Brand Identity”. Again, a heavy marketing influence in the choice of topics. 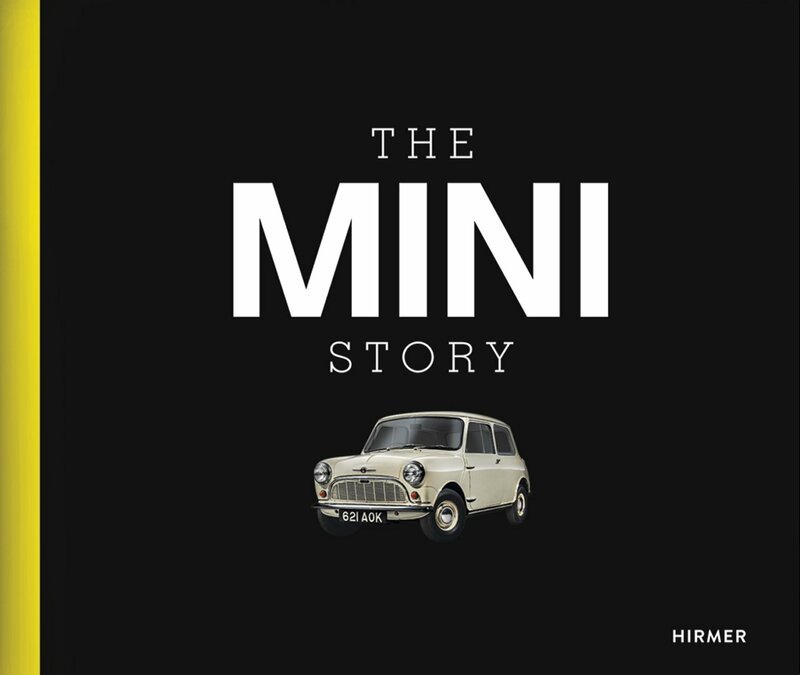 No MINI book would be complete without a biography of Sir Alec Issigonis and this one presents his life and achievements in yet another timeline. Further topics include “The First Mini”, A Miracle of Space”, “The Classic Models”, “Community”, and “Individuality” all broken into bite-size bits. MINI enthusiasts know the brand has had a long success story in rallies and on the track. Chapter 3 covers Mini’s success in the 1960s highlighting the three Monte Carlo wins, of course. Intertwined are more modern racing topics including the MINI Challenge series and success at Dakar. Finally, there are mini bios of racing drivers Rauno Aaltonen, Paddy Hopkirk, Timo Mäkinen, Niki Lauda, and Stéphane Peterhansel. Perhaps the best chapter in the book is the one covering Design and Technology. 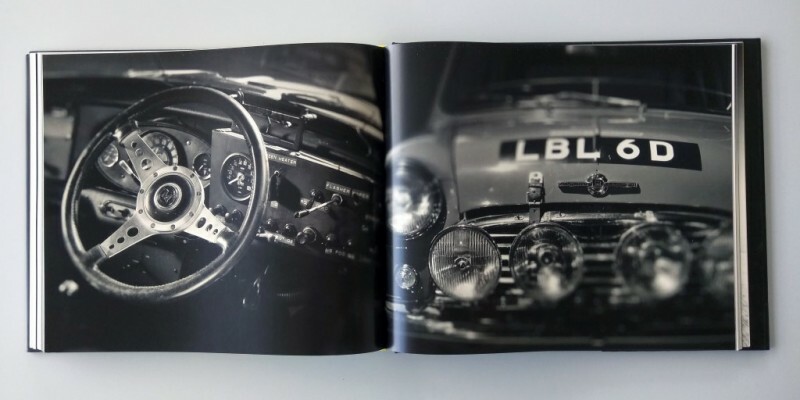 Focusing on the design of the new MINI, the book gives a fascinating look into exterior and interior design of the MINI and goes over the iconic design features and the overall philosophy. After “Design”, topics include “Growing up”, “Design Process”, and “Design Sketches”. At this point the glossy pages give way to an unnumbered section of matte pages with beautiful full-page design sketches from designers like Frank Stephenson, Tony Hunter, Marcus Syring, Henning Holstein, and others. Back into the main text, the chapter continues with an overview on “Production” and a surprisingly brief run-through of “The Engine” of each MINI generation. More specifications here would have been appropriate and appreciated. Again, the choice of content is aimed at the casual reader and is not an in-depth study of the cars. Despite the chapter title, there was very little technology hightlighted here. While much of the content so far is about the new MINI, Chapter 5 is explicitly titled “The New MINI”. It begins with another timeline covering the BMW era from 1994 to the present. Again, there are bite-sized sections on MINI concepts and models including: MINI ACV 30, Spiritual, the new MINI, MINI Convertible, MINI Concept Geneva (Clubman), MINI Clubman/Clubvan, MINI Coupé Concept, MINI Countryman, MINI Beachcomber Concept, MINI Rocketman Concept, MINI Roadster, MINI Pacemen, MINI XXL (stretch limousine), MINI Superleggera, and the new MINI Clubman Concept. The rest of the book from page 156 on contains only photographs. Chapter 6 is exactly what its title implies: a “Gallery” of color and black & white photos. The only text is the model name and year at the bottom of some pages. Many of these pages are ones you want to cut out and put in a picture frame. There is a good mix of artistic and journalistic photographs. If you want a thorough chronological history or detailed information about Mini and MINI models, this isn’t the book for you. But if you want an entertaining and visually-pleasing read, with official and authentic MINI inside information, you’ll want to add this book to your collection. While you can read The MINI Story cover-to-cover, this is a book best read in short bursts. Buy the book, put it on your livingroom table, and pick it up any time you need a dose of MINI reading. Buy The MINI Story from Amazon, Amazon UK, or Barnes & Noble. This entry was posted in news and tagged history press on January 11, 2013 by James Day. MINI looks back over 2012, its most successful sales year since launch. Munich/Oxford. The British premium small car manufacturer MINI can look back on an eventful year marked by new sales records, successful model launches and expansion into new markets worldwide. 2012 once again served up a wealth of highlights for brand aficionados, as well as being the most successful year to date for MINI. Not only has the vehicle line-up been extended to seven models, meaning more choice than ever, but MINI is now represented in over 100 markets around the globe for the very first time. Worldwide sales of the MINI brand totalled 301,526 units last year, more than in any previous 12-month period. The MINI review of 2012 summarises the year’s most important, most extraordinary and most astonishing events. January: MINI kicked off the year with yet another first when the British carmaker showcased its model range at the Auto Expo in the Indian capital of New Delhi for the very first time. This coincided with the opening in New Delhi and Mumbai of MINI’s first showrooms on the subcontinent. This made India the 100th market in which MINI is active. There is obviously a huge appetite for premium small cars there too, with 50,000 fans registering on MINI India’s Facebook page in the space of just a few weeks. In Europe, the year commenced with the introduction of two special-edition models, the MINI Baker Street and MINI Bayswater, whose exclusive design and equipment features have injected some contemporary London style into the streetscape. February: The launch of the MINI Roadster extended the brand’s line-up to six models. The first open-top two-seater from the British carmaker radiates an aura of puristic sportiness. The manually operated soft-top roof, steeply raked windscreen, low centre of gravity that has been weighted forwards, and an automatically extending rear spoiler allow driving pleasure to be experienced at its most intense. The MINI Roadster range boasts a choice of four particularly feisty engines and is spearheaded by the MINI John Cooper Works Roadster with 155 kW/211 hp – never before have MINI drivers been able to feel such a vigorous rush of wind through their hair. The MINI brand reinforced its presence in the Middle East sales region with its market entry into the Kingdom of Jordan. The MINI showroom in the heart of the capital Amman presented customers with a choice of the entire MINI range from day one. March: The MINI John Cooper Works Countryman received its world premiere at the Geneva Motor Show. It is the first John Cooper Works model to direct the power from its engine to all four wheels. Developed with the aid of motor racing knowhow, the turbocharged engine comes in its most powerful 160 kW/218 hp version and teams up with the standard ALL4 all-wheel-drive system to guarantee tremendous fun at the wheel over any terrain. The list of standard equipment also includes sports suspension, 18-inch alloy wheels, a sports exhaust system, as well as an aerodynamics kit. The MINI John Cooper Works Countryman can also be specified with an optional six-speed automatic transmission. Meanwhile, the introduction of the MINI Highgate Convertible brought some real style to bear in the world of open-top motoring. The new special-edition model fuses exclusive flair and individuality with a generous dose of Brit-cool. April: Individuality was very much the focal point of MINI’s show stand at the Auto China in Beijing, where the MINI Clubman Hyde Park celebrated its world premiere. There was also a debut for the MINI’s forefather, with five classic Mini cars taking part in the Allgäu-Orient Rally for the first time. This alternative race for classic cars and recent classics sets off from the village of Oberstaufen in Bavaria before heading for the Azerbaijani capital of Baku, over 5,000 kilometres (3,100 miles) away. MINI also took the opportunity to join in congratulating the international language of Esperanto on reaching a special milestone: 125 years ago it began to take the world by storm, eventually becoming a cultural asset that is fondly cherished in over 100 countries – very much in the mould of the MINI. May: The former F1 circuit in Le Castellet, France was the place to be for the global MINI Community when it hosted MINI United 2012. Some 30,000 delighted MINI enthusiasts were able to revel in three days of top international music acts, motor racing action and a throbbing party atmosphere, all themed around the MINI. The stage buzzed to the sound of live performances from bands such as Iggy and the Stooges and Gossip. The same month saw MINI supporting the Life Ball in Vienna, Europe’s biggest charity event, for the 12th time. The Life Ball combines a fashion show with doing some good for society. MINI continued its tradition of donating for auction a vehicle specially designed for the occasion, the proceeds of which go to projects that have been set up to combat HIV and AIDS. Over 4,000 classic Mini fans descended on Lake Balaton in Hungary, meanwhile, for the International Mini Meeting, the largest gathering in the classic Mini Club calendar. June: MINI unveiled yet another new model, this time one that had been designed with special transport tasks in mind. The MINI Clubvan combines all the practical strengths of a compact delivery van with the driving fun for which the brand is renowned along with highly distinctive looks. It comes with two seats and 860 litres of load space, which owners can easily make the most of thanks to the split door at the rear. Not only is the first premium vehicle of its kind highly versatile, it also makes an ideal mobile calling card for tradespeople who are anxious to create a stylish impression when delivering goods to their customers. The trade publication “Automobilwoche” awarded its top rating of “Triple A” (Automobilwoche Award Autohandel) to the MINI sales force in Germany. In a study into the professionalism of personnel in car dealerships, MINI salespeople emerged as the best source of advice for potential customers amongst the premium brands. July: London calling – yet more highly alluring special-edition models were brought out in the guise of the MINI Hyde Park and MINI Green Park, which celebrate the British way of life with far more than just their names. Their exclusive colour scheme and classy appointments fuse extravagance with understatement to superb effect. In the United States, MINI extended an invitation to take part in a unique coast-to-coast rally with the slogan MINI TAKES THE STATES: the MINI Community set out for Los Angeles from New York on 4 July, Independence Day. August: The brand’s sporty streak was on show once again at the opening of the Moscow International Automobile Salon, with a stand that centred around the new John Cooper Works models. September: The seventh model in the brand’s line-up, the MINI Paceman, made its world debut at the Paris Motor Show. With two doors and a large tailgate, powerful proportions, flowing coupé-like lines, plus a lounge-style interior featuring two individual seats in the rear, this is the first Sports Activity Coupé in the premium compact segment. The MINI Paceman can be equipped with the ALL4 all-wheel-drive system as an option. The fastest MINI ever built blasted onto the scene as the second crowd-puller at the Mondial de l’Automobile – but not for long. The MINI John Cooper Works GP is being built in a limited run of just 2,000 units for racing enthusiasts all over the world. Awaiting them is a scintillating and exclusive sports machine featuring a 160 kW/218 hp turbocharged four-cylinder power unit, adjustable coilover suspension, an ultra-powerful sports braking system, Driving Stability Control with GP race mode and precisely honed aerodynamic measures, along with model-specific alloy wheels and sports tyres. The MINI John Cooper Works GP was fine-tuned on the Nürburgring’s legendary Nordschleife circuit, where it recorded a best time of 8:23 minutes. This same month, the classic Mini scooped a great accolade in its home country when, 53 years after it first went into production, readers of the UK car magazine “Autocar” voted it the “Greatest British car ever made”. And nowhere are the sheer thrill of this British classic and its phenomenal go-kart feel more apparent than on the BMW Group’s test track in Aschheim near Munich, where the classic Mini driver training courses are held. October: MINI sought and found 25 test drivers from the Munich area for the brand’s first-ever all-electric car. For five months, the testers taking part in the latest field trials will drive the MINI E under everyday conditions; their impressions and experiences will subsequently be incorporated into the scientific analyses of both user behaviour and the infrastructure requirements for electric vehicles. November: An intense racing sensation with fewer refuelling stops – a transformation is taking place under the bonnet of the John Cooper Works models. The latest incarnation of the turbocharged engine with motor racing breeding now goes about its business even more efficiently. The 155 kW/211 hp four-cylinder unit’s twin-scroll turbocharging and direct petrol injection technology is now supplemented by variable valve timing, which enhances both engine responsiveness and fuel efficiency. The MINI Paceman received its US premiere at the Los Angeles Auto Show, where new paint finishes and detailed interior styling modifications for the MINI Countryman were also revealed. The MINI One Countryman and MINI Cooper Countryman models now meet the EU6 emissions limits as standard. In London, highly creative use of space resulted in not one but two entries in the Guinness Book of Records: on the same day that 28 female gymnasts managed to squeeze into a MINI, 23 members of the same gymnastics team from East Sussex succeeded in cramming themselves into a classic Mini, setting another world record. December: This time it was the turn of MINI to set a new personal best, with annual vehicle sales topping the 300,000 mark for the first time. To be exact, worldwide MINI deliveries up to the end of the year totalled a record-breaking 301,526, meaning that the brand’s sales were up by 5.9 per cent compared to 2011. Sales were once again strongest in the USA, followed by MINI’s home country, the UK, and Germany. The forecasts for 2013 similarly make for positive reading. The MINI Paceman is due to be launched in March, while the brand also plans to move into more new markets. Central America provides the latest evidence of MINI’s successful expansion. The new age predicted by an ancient Mayan calendar dawned there just a few days before Christmas – with absolutely no sign of the end of the world, but with plenty of good omens for the MINI brand. Download photos and the press release MINI takes a look back over the most successful year in the brand’s history. This entry was posted in books collectibles and tagged classic Mini history on March 28, 2010 by James Day. Originally published in 2005, the hardcover book was reissued in 2009 as the 50th Anniversary Edition. collectible of the day: MINI The Book. This entry was posted in books collectibles and tagged classic Mini design history on January 12, 2010 by James Day. In December 2006, BMW (and MINI Brand Management) published this first official book about the MINI. 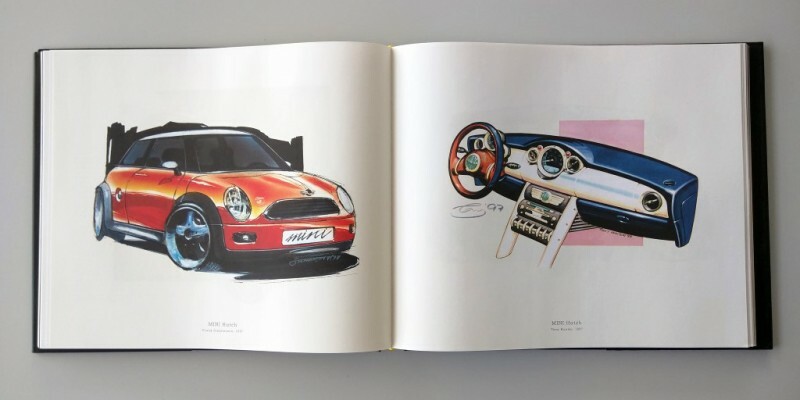 Filling the hardcover book’s 190 pages are numerous photos and illustrations of good design; people who inspired, and were inspired by, the Mini and MINI; and stories of the people who created the Mini legend and then the new MINI rebirth. Read about Sir Alec Issigonis, John Cooper, and Rauno Aaltonen as well as contemporary fashion designers Paul Smith and Mary Quant. The MINI is a phenomenon. Almost 50 years after its launch it is more popular than ever. The success of the MINI spans the globe and transcends all languages, latitudes, complexions and cultures. 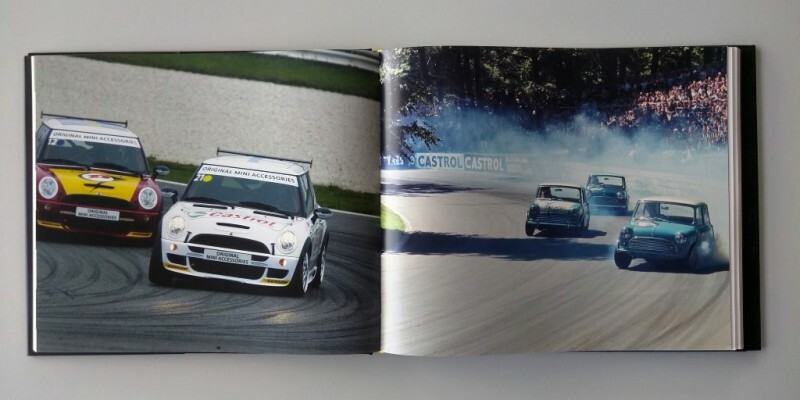 MINI The Book is the definitive publication on the definitive car. Ten cult photographers, creative designers and artists present their own take on the MINI, backed up by a host of stories, anecdotes, facts and figures, and the lowdown on the rising MINI Community. Plus, there’s everything you wanted to know about the men who made the MINI into the timeless legend it is. Buy MINI The Book from Amazon.com or Amazon.de.